If you spend a moment with San Francisco Deltas coach Marc Dos Santos, it’s easy to see why he has one of the country’s sharpest soccer minds. The fact that he’s in his third league final in three years, and fresh off picking up his second NASL Coach of the Year award, should come as no surprise. Dos Santos has now led three different teams to a final in successive years and has a chance at some revenge in 2017 after losing to his counterpart Giovanni Savarese and the New York Cosmos in The Championship Final in 2015. 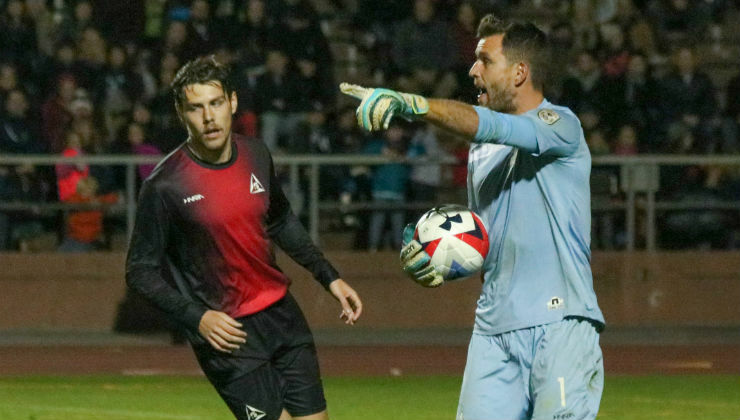 Despite being a first-year club, San Francisco was the one side that was actually in realistic striking distance of catching Miami FC in both the Spring and Fall Season title races. While the club was unable to claim either trophy, the Deltas finished second in the Combined Standings and now have a chance to win the league’s ultimate prize: the Soccer Bowl Trophy. “First of all, it takes for you as a coaching staff to choose the right group,” Dos Santos said. “The selection and decision of the squad, and the players you bring in, is a very important factor. It takes the coaching staff to have a clear idea of how they want to address the game, what kind of DNA they want to give to the team, and it takes coherence to stick with it and not change game by game. Romuald Peiser, who played with Dos Santos for two seasons in Ottawa before eventually linking back up with him in San Francisco, noted the role the Canadian-born coach has played. “In soccer in North America, there aren’t a lot of coaches who have his background in Europe and South America,” Peiser said. “He knows every player well. The veteran goalkeeper also noted what makes Dos Santos “special” is his ability to be so prepared for each matchup. The results have born the fruit of the hard work before the game kicks off. Over the course of the campaign, with a squad of veteran NASL players, as well as players with key experience abroad, the Deltas were incredibly steady, including only losing one game away from Kezar Stadium. “It gives the group confidence that we’ve been consistent all year,” said forward Tommy Heinemann, who led the club in scoring with nine goals on the year. Heinemann was a key focal point in the attack of Dos Santos’ side in 2015, a year that saw him score 12 goals, including four more throughout The Championship, the league’s four-club postseason tournament. Having been to the NASL postseason before, Heinemann and several of the squad members knew just what it would take to be fighting for the title come November. The club certainly had its down moments in its first year, including losing two games in a row to Miami by an aggregate score of 10-1 – Miami clinched the Spring Season title with a 7-0 win over San Francisco. Those moments, however, turned out to be blips on the radar rather than setting a trend. To close out the Fall Season, the Deltas only lost once over their last 11 contests, and it should be noted that Dos Santos opted to rest several of his regulars in the final game of the Fall Season. At that point, the club already knew that it had its place booked in The Championship as the No. 2 seed. After taking down North Carolina FC at home in the semifinal round, the Deltas and Dos Santos will look to win one more in front of the home fans against the New York Cosmos this Sunday night to cap off a remarkable run on the field.